The song ‘Sailing" was composed by Gavin Sutherland of the Sutherland Brothers in 1972 but is best known as a 1975 international hit for Rod Stewart. Rod took the song to No.1 in the UK for four weeks in 1975, it returned to the charts in 1976 and again in 1987. It was easily Stewarts greatest UK release. ‘Sailing’ had its UK chart revival in 1976 as a result of the track being used as the theme song for ‘Sailor’. This was a documentary series on the HMS Ark Royal which the BBC1 aired for ten weeks from 5 August 1976. 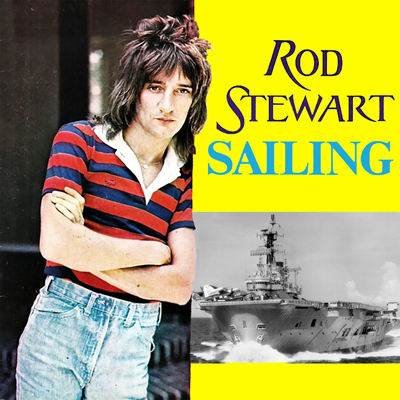 As the British task-force sailed out of Portsmouth Harbour on 5 April 1982 (the third day of the Falklands War) a recording of Rod Stewart's "Sailing" was broadcast from the quay's public address system.